Size: 6 ft. high and wide. Flowers: Tubular bright orange flowers, 2 in. long, covered with fine hairs, in dense whorls; late spring to summer. Leaves are slender, green, long, toothed edges. Uses: Color and shape accent, background, screen. Combines well with succulents. Fire resistive. Wildlife: Hummingbirds, bees, butterflies. Deer resistant. Soil: Tolerates a variety; should be well-drained. Pruning: Cut back in late winter to maintain foliage character and flower production. Responds well to pruning. Pests & Diseases: No serious insect or disease problems. Watch for whiteflies and spider mites on overwintering plants. Notes: Replace when it no longer looks good. 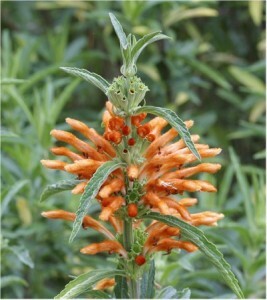 In South Africa, grows on hillsides and slopes with intermittent wet and dry periods. Hardy to 20° F.